All of the predefined windows are modal. Each of the methods has an overload that takes an object of type DialogParameters as an argument. The DialogParameters class has members similar to the specific ones of the RadWindow. This allows you to configure the predefined dialogs via the argument of the method. For more info about the class read here. DialogParameters dialogParameters - an object of type DialogParameters. object content - an object that represents the content. object content, EventHandler<WindowsClosedEventArgs> closed - an object, that represents the content and an event handler that should handle the Closed event of the RadWindow. The DialogResult of the WindowClosedEventArgs will be True if the user has pressed OK and null if the user clicked the close button of the window. The PromptResult property will always be null. object content, EventHandler<WindowsClosedEventArgs> closed - an object that represents the content and an event handler that should handle the Closed event of the RadWindow. 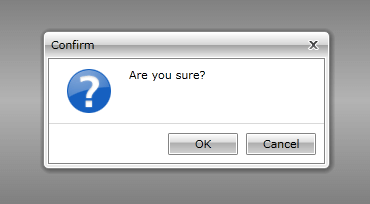 The DialogResult of the WindowClosedEventArgs will be True if the user has pressed OK, False if the user clicked Cancel and null if the user clicked the close button of the window. The PromptResult property will always be null. Dim message = "Hello " & result & "!" object content, EventHandler<WindowsClosedEventArgs> closed, string defaultPropmptResult - an object that represents the content, an event handler that should handle the Closed event of the RadWindow and a default result value. 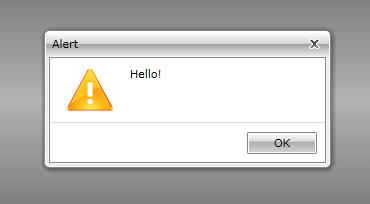 The DialogResult of the WindowClosedEventArgs will be True if the user has pressed OK, False if the user clicked Cancel and null if the user clicked the close button of the window. 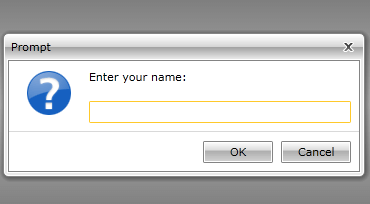 The PromptResult property will hold the value entered by the user if they clicked OK and null otherwise. If you want to change the appearance of the predefined window, you have to show it by calling the overload that takes a DialogParameters object as an argument. Create an appropriate style and set it to its WindowStyle property. To learn more read here.